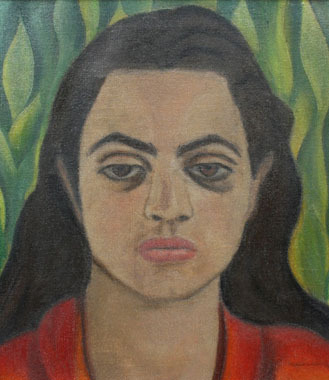 Mary E. Hutchinson’s 1933 portrait of Rosalie Lanza sold at auction last week. This is one of several portraits of Rosalie painted by Hutchinson between 1932-1935. The subject was the sister of Hutchinson’s partner, Joanna Lanza. For the exhibition history and more about the artist, see my digital catalog Artworks of Mary E. Hutchinson at http://meh.omeka.net. Needless to say, I would love to hear from the new owner of “Rosalie”! Leave a comment and let’s connect. A portrait of Lola (?) –a beautiful woman–was exhibited on Antiques Road Show on November 16, 2015–from NYC. The subject was a close friend of the artist’s, who worked as a cigarette girl at the Copa in NYC. « Interested in Mary E. Hutchinson, artist? Contact me! You are currently reading Sold at Auction! Mary E. Hutchinson’s “Rosalie” at Jae Turner.